Room 7 to 14 : in the main block complex. There are 4 rooms downstairs and 4 rooms upstairs. ** The 2 middle rooms on the bottom floor and 2 middle rooms on the top floor are inter-leading rooms and they can both be booked of you want to sleep up to 8 people. All bookings are Bed and Breakfast. DOXA Beach Hotel can easily sleep 28 people in 14 comfortable and spacious rooms – with the option of having a twin or double bed or even fitting a third bed in for a child. All rooms have en-suite bathrooms including a separate toilet, washbasin and shower (and/or bath depending on the booking). The beds, mattresses as well as mosquito nets have been chosen for maximum comfort and the majority of the rooms (and beds!) are facing the ocean offering stunning views (sunrise and even whale watching opportunities). To deal with Mozambique’s subtropical climate we have chosen big sliding doors with fly-nets for better airing as well as fitted electric fans. In order to fit in with the natural dune vegetation all colours were carefully selected ranging from creamy sandy – beige inside to light olive greens on the outside. For more privacy and exclusiveness the accommodation is split up into two complexes embracing the rest of the hotel: The hotel-style double-story complex (2 x 4 rooms) with a solid concrete roof and private verandas or balconies in the North and two separate houses (3 rooms each) with verandas or garden and local grass roofs to the South. 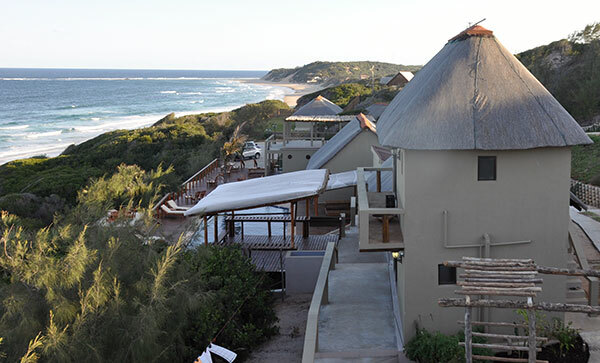 Our Klipfontein Restaurant as well as Rio Saiñas Bar, DOXA Dive School and the 15m x 5m x 4m deep pool with seaview are only steps away from either side of the accommodation making sure that you are well looked after. Complimentary tea and coffee facilities as well as icy cold water can be found in all of our rooms. If there is anything else we can do for you – never hesitate to contact one of our friendly and helpful staff!